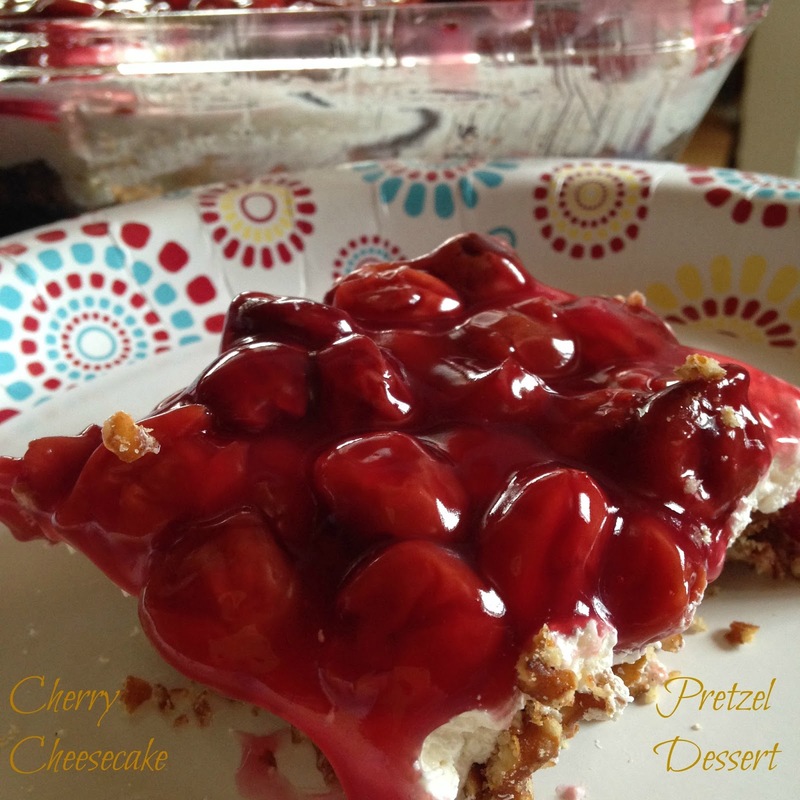 Cherry Cheesecake Pretzel Dessert is sometimes called: Strawberry Pretzel Salad or even Raspberry Pretzel Dessert. I’ve also heard this “dessert” called a “salad” but to me it’s more of a “dessert” than a “salad.” but is it? Oh, I can’t decide. 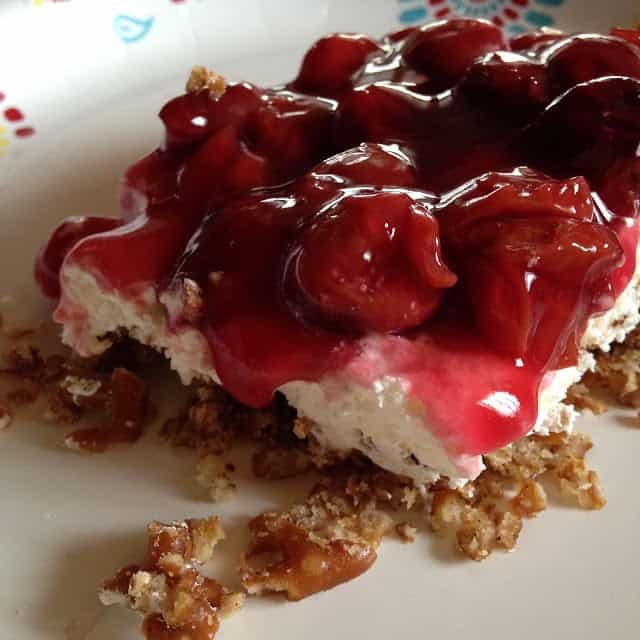 What do you call this “dessert/salad?” My sister served this “dessert/salad” years ago at a picnic and that’s when I first feel in love with this irresistibly sweet, salty and delicious dessert/salad. She made this with frozen (sweetened) strawberries and strawberry jello. Some people have made this with frozen (sweetened) raspberries and raspberry jello. 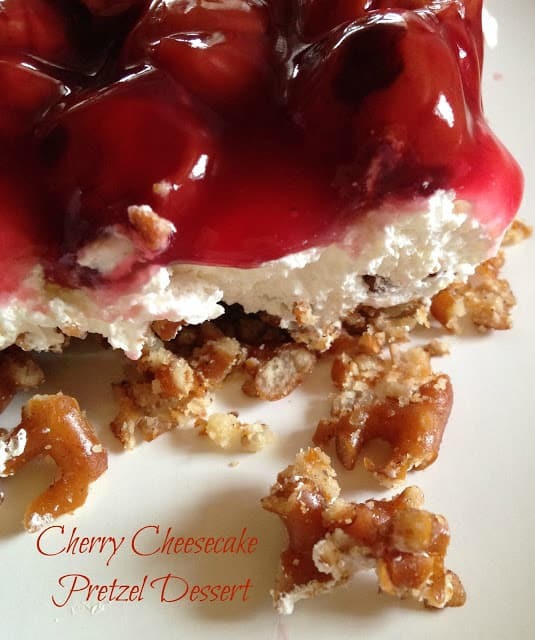 Cherry Cheesecake Pretzel Dessert/Salad, Strawberry Pretzel Salad or Raspberry Pretzel Salad is an easy and delicious, sweet and salty dessert/salad that has been around for a long, long tine. It’s been served at family reunions, barbecues and church picnics for years. Your family and friends will keep coming back for more. I promise! 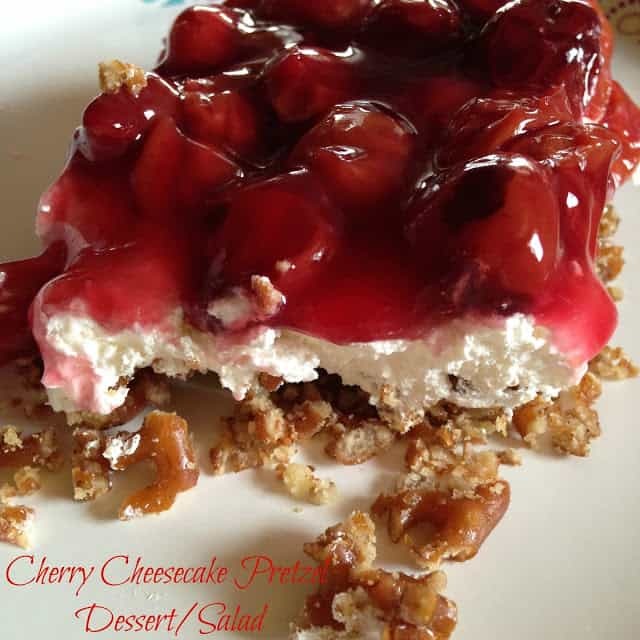 Since I can’t decide if Cherry Cheesecake Pretzel Dessert/Salad is a dessert or a salad I’m just going to say dessert/salad. Most people have heard of this dessert/salad, many people have tried this dessert/salad and some of us have even made this dessert/salad. It’s been around for as long as I can remember. There are a few variations of this dessert/salad but the three things that never change are the layers. The crust or bottom layer is always crushed pretzels plus other ingredients, the middle layer is cream cheese and cool-whip plus powdered sugar and the top layer is sweetened, frozen strawberries or raspberries, thawed then mixed with strawberry or raspberry jello or fruit pie filling. Personally, I like to use pie filling as the top layer because then you can change it up from time to time. One can of fruit pie filling can change the complete taste of this dessert/salad. You can substitute Blueberry, Raspberry, Blackberry, Lemon, Cherry-Cranberry and so on. You can use homemade pie filling or you can purchase canned pie filling. Normally when this dessert/salad is made with strawberries or raspberries and the corresponding jello, frozen sweetened strawberries or raspberries are used. One universal feeling on this dessert/salad is…no matter what you call it or how you make it and what ingredients you use…It’s Irresistibly Delicious! One universal feeling on this dessert/salad…no matter what you call it or what ingredients you use to make it…It’s Irresistibly Delicious! In a mixing bowl, place cream cheese. Microwave for one minute, with hand-held electric mixer beat on low until creamy. Add simply cheesecake dip and beat again until creamy. Fold in non-dairy whipped topping. Refrigerate for at least 1 hour. Mix the pretzels, sugar and cinnamon with the melted butter. Press into a lightly greased 13 x 9 inch baking dish. Bake at 400 degrees for 8 to 10 minutes or until firm and crisp. Allow to cool completely. 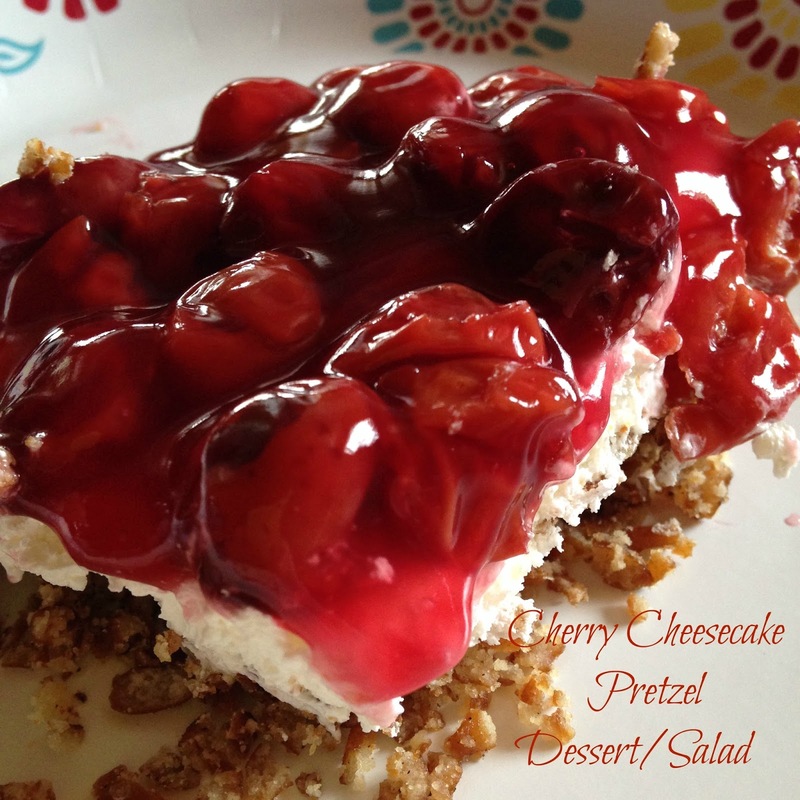 Carefully spread cheesecake layer over the cooled pretzel layer. Refrigerate for at least 2 hours. Pretzel bottom never set so very hard to spread the cream cheese mixture. Put it in the fridge overnite still didnt set up plus the cinnamon was odd tasting….very disappointed glad i wasnt taking this to someones house! Directions are incorrect regarding stirring cream cheese. You absolutely must beat cream cheese & sugar til smooth then fold in Cool whip. If You dont Its Impossible To Spread.